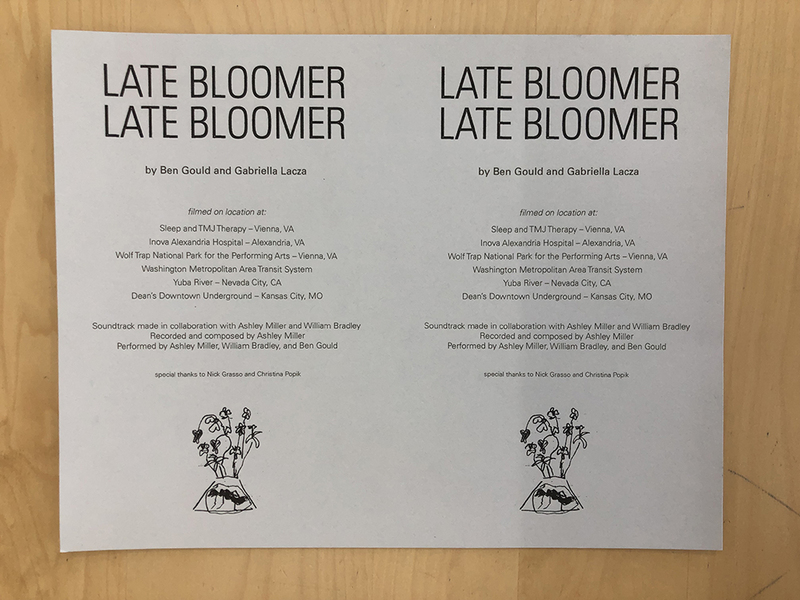 Late Bloomer invitation to a multidisciplany project by Ben Gould and Gabriella Lacza at LACA on April 12th and Driveway 327 April 15th. Late Bloomer Late Bloomer is at once performance documentation and independent video work that has developed over the course of three years spent visiting Ben’s doctor in Vienna, Virginia for Tourette Syndrome-related treatment. The film encapsulates a series of performances that take place in various real and imagined sites within the artists’ built mythology. Questioning how filmic devices might inject energy, location, and time into performance documentation, the piece contextualizes itself, weaving together the familiar and unfamiliar, through the use of sound, cinematography, and narrative. Parallel to the artists' collaborative practice, the film is informed by the raw energy of Ben’s Tourette’s as it acts as both motor and muse. The film presents two performances, linked through contextual and fantastical imagery, and an original soundtrack, composed through the cataloging and manipulation of all of Ben’s possible Tourette’s vocalizations. Sculptural objects and ephemera will be on display at LACA on the evening of the screening, with an installation and live performance to follow on Sunday, April 15th at Driveway 327. This event features new works that incorporate elements from the world of Late Bloomer Late Bloomer, as well as performative objects and protective clothing made by Gabriella and tailored to Ben's body and movement. Organized by Harris Bauer and Rachel Zaretsky of Hosting Projects, the screening will be accompanied by a presentation of the projects’ archive and a discussion with the artists.